Houghton Valley School operates an enrolment scheme. Currently, only children from households within the enrolment zone are eligible to enrol. See the map below for the exact zone details. Parents are encouraged to contact the principal regarding any enquiries related to the enrolment scheme. We encourage you to enrol your child at Houghton Valley School as soon as possible. While enrolment is not binding, it helps us manage our planning. Thanks. Children who live within the ‘home zone’ are eligible to enrol once they reach 5 years of age. As a school we appreciate that beginning school is a very big step and therefore we try to make the transition to school as smooth as possible. We advise parents/caregivers to contact the office administrator or principal at least 6 weeks before their child is due to begin school to obtain an information pack, which includes an enrolment form. This should be filled out and returned to the school. We also encourage prospective parents/caregivers to phone the office to arrange a time to meet with the principal and have a tour of the school. In the weeks prior to your child beginning school our new entrants’ teacher will phone to arrange a series of visits for you and your child. These are designed to introduce new children to the school environment, teacher and classmates. Once your child starts school we welcome regular contact. Providing you live within the Houghton Valley School zone you may enrol your child at any time. We prefer to meet with you and your child prior to enrolment so that we can get to know you before your child begins at Houghton Valley School. All students who live within the home zone described below and shown on the attached map, shall be entitled to enrol at Houghton Valley School. From 249 to 424 Queen’s Drive (south past Dorrie Leslie Park and Waitaha Cove). From 01 to 172 The Esplanade. All of the following streets or roads, Houghton Bay Road, Cave Road, Hungerford Road, View Road, Buckley Road, Orchy Crescent, Earn Place and Bann Street. All of Southgate Road including all of Arun Crescent and Rydal Place. Melrose Road from 105 to 68 including all of Witham Street and Foyle Street. 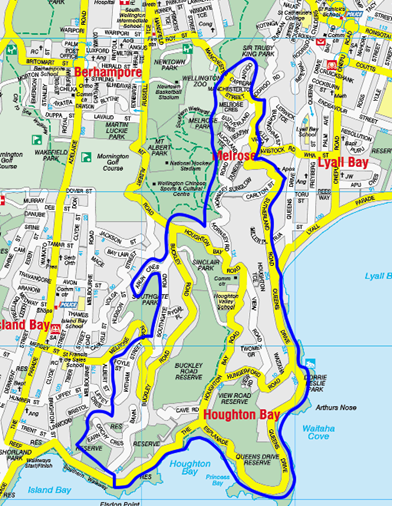 All of Hornsey Road including Sunglow Avenue, Dunedin Terrace, Auckland Terrace and Heaphy Way. Manchester Street until where it is intersected by Caprera Street. This includes all of Melrose Crescent, Caprera Street and Antico Street. All of Sutherland Road including Carlton Street, Houghton Terrace and Miller Place. Each year the board will determine the number of places which are likely to be available in the following term for the enrolment of students who live outside the home zone. The board will publish this information by notice in a daily or community newspaper circulating in the area served by the school. The notice will indicate how applications are to be made and will specify a date by which all applications must be received. If there are more applicants in the second, third, fourth or fifth priority groups than there are places available, selection within the priority group will be by a ballot conducted in accordance with instructions issued by the Secretary under Section 11G(1) or the Education Act 1989. Parents will be informed of the date of any ballot by notice in a daily or community newspaper circulating in the area served by the school. Please contact us for information or an enrolment pack.